Hundreds of thousands of people commute to their desks in the city of London every day. Whether your journey takes 15 minutes or 2 hours most will be based at their desks for 8 hours or more each day. So, how do you keep the weight off when you have a desk job or a sedentary lifestyle? Let’s start with some good news. Experts estimate that weight loss generally consists of 75% diet and 25% exercise and people can experience weight loss by eating smarter. This translates into the fact that there are many things you can do to ensure a long and healthy life which means breaking your current unhealthy eating routine. It is easier said than done, but minor changes will overhaul the remainder of your working life, daily cognitive abilities and quality of life. If you feel yourself gaining a pound or two a week even after Christmas, you must put an end to mindless snacking and routine unhealthy eating habits at your desk under the glow of fluorescent lights. Stressful jobs can make you feel like you should never leave your desk and can also lead to emotional eating. By law you have a lunch break how you choose to use it is your decision. Drink Water – Many people must leave their homes before they feel hungry. Fine, drink a pint of water before you leave your house or on your commute. Water fires up your metabolism, hydrates you, helps your body flush out toxins, gives your brain fuel, and may even make you eat less. When you’re not properly hydrated, you can feel drained, and experience fatigue or mood fluctuations. If you are one of the growing number of morning caffeine addicts drink that pint of water before your morning coffee. Do not skip breakfast eat or drink slow release carbs like porridge with almond milk, berries, Greek yoghurt, bananas or a delicious breakfast smoothie with all the slow release carbs, fibre and nutrients which will see you through the next 2 hours. Walk – Check out your journey and see if you can add 30 minutes of walking to your daily commute. Use stairs rather than escalators as walking for an hour a day can reduce the risk of diabetes, heart disease, blood pressure, stroke, breast cancer, colon cancer, dementia, depression, and help you sleep better as well as improve cognitive function. Stretching at your desk can work wonders and you can find many desk exercises online. Make sure you are comfortably set up at your desk to prevent RSI. Avoid the lure of vending machines and prepack your healthy breakfast, snacks and lunch or order from a local healthy meal delivery supplier. Standing as much as possible improves your blood-sugar levels, which is good for weight loss. 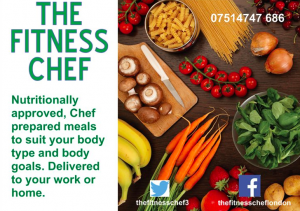 The Fitness Chef has nutritionist approved plans to help find your perfect portion size and offer nutritionally balanced breakfasts, lunches, dinners and snacks. We make balanced meals available to busy London workers and produce fresh, nutritionist approved dishes and smoothies, which can be delivered to your door or picked up from our kitchen based in the City Point Building, Moorgate. For anyone who needs a more bespoke meal plan we are more than happy to provide a tailor-made service please contact us by Email.